The bodies of Omarkhayam Maute (top, below inset) and Isnilon Hapilon are seen inside a military helicopter after they were killed by troops in the main battle area of Marawi City yesterday. Hapilon was the leader of the Abu Sayyaf and the Islamic State’s anointed ‘emir’ in Southeast Asia while Omar Maute was one of two brothers who founded the Maute terrorist group in Mindanao. LANAO DEL SUR, Philippines —Military sharpshooters killed two leaders of the Marawi siege before dawn yesterday as security forces made their final push to retake the city from militants linked to the Middle East-based Islamic State (IS). 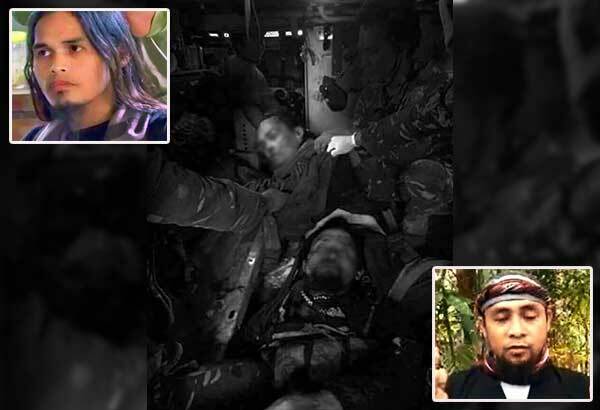 Abu Sayyaf leader Isnilon Hapilon and the Maute terror group’s acknowledged head Omarkhayam Maute were killed one after the other at separate locations by elite Army Scout Ranger snipers using long-range rifles fitted with night-vision scopes. Armed Forces of the Philippines (AFP) chief Gen. Eduardo Año said President Duterte was “very happy” about the development and expressed his wish to go to the battle-scarred city yesterday morning. “The President (wanted to be) here this morning but we expect heavy fighting today,” Año said in Marawi. Another high profile militant still in the main battle area in Marawi is Malaysian Dr. Mahmud Ahmad, reportedly a recruiter and financier of IS in the Philippines. Eight other foreign terrorists – mostly Indonesians and Malaysians – were believed to be still holed up in Marawi, authorities said. The Marawi battle, which broke out on May 23, has so far left more than 800 militants, 162 government forces and 47 civilians dead, according to authorities. President Duterte had ordered aerial bombing of the militants’ positions, sending them into retreat but leaving the city in ruins. Malacañang earlier announced a P10-million bounty for Hapilon and P5 million each for Maute brothers Omar and Abdullah. Abdullah was believed to have been killed in September. The United States had a $5-million bounty for Hapilon, said to be the anointed emir of the IS “caliphate” in Southeast Asia. Combatants of the Army’s 8th Scout Ranger Company found the remains of the two terror leaders at separate locations, according senior members of the League of Mayors in Lanao del Sur and incumbent officials of the provincial government. Military sources said the two were among the more than a dozen gunmen killed in battle in the past days by the elite Rangers, who reportedly used remote-controlled devices to locate the militants’ exact locations. Año said seven bodies – presumably those of militants – were recovered yesterday from the main battle area. The STAR received text messages from relatives of Hapilon in the nearby Maluso and Lantawan towns confirming his death. “Wafat neh Sir. Sure ne teed,” texted a cousin of the terrorist in the Yakan dialect, which meant Hapilon’s clan had confirmed his death. Año described yesterday’s battle as intense. “This is the end, this Maute group. This is their center of gravity and everything has crumbled,” he said in Filipino and English. The death of the two notorious militants is seen to hasten the liberation of the country’s only Islamic city, he said. “Despite the criticisms of his detractors, President Duterte pushed on an unrelenting campaign to take back Marawi City through all means at his disposal,” Andanar said. Aside from the killing of Hapilon and Maute, yesterday’s military operations also led to the rescue of 17 hostages. “We will also announce the termination of hostilities once government troops have ensured that the remaining terrorists holed up in the city are neutralized or captured and that they have cleared all structures of improvised explosive devices and other traps,” presidential spokesman Ernesto Abella said. “Once the fighting stops and the clearing operations end, we will put our efforts and energies on the challenging task of rebuilding and rehabilitating Marawi,” he added. Duterte had visited Marawi six times to express his support for the troops. Año said the President wanted to go to the city yesterday but was advised not to do so until the operations against terrorists are completed. At Camp Aguinaldo, Defense Secretary Delfin Lorenzana said information from a rescued female hostage helped the military trace the building where the two terror leaders were hiding. “They were able to get Isnilon Hapilon and Omar Maute. They were both killed. In fact, their faces have already been splashed in the internet and in the websites, plus they were able to recover 17 hostages,” Lorenzana told reporters. While the end of the Marawi battle is on the horizon with the death of Hapilon and Maute, Lorenzana said security forces would have to be very careful in their final push as the militants were still holding some 20 hostages. Moreover, some militants may have established cells in Basilan, Sulu and in Central Mindanao, he said. “But we will also get them,” he added. Meanwhile, AFP spokesman Maj. Gen. Restituto Padilla said it’s not for the military to decide who should be given the reward for the elimination of Maute and Hapilon. “The Armed Forces is not thinking about the rewards here. What we have struggled to do is fulfill our mission, which is to rescue all the hostages,” he explained. “We don’t know if the rewards should go to the soldiers, to the policemen or to the informant,” he said in Filipino.